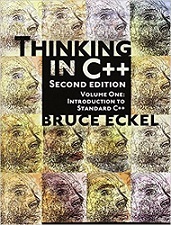 Thinking in C++ patiently and methodically explores the issues of when and how to use inlines, references, operator overloading, inheritance and dynamic objects, as well as advanced topics such as the proper use of templates, exceptions and multiple inheritance. The entire effort is woven in a fabric that includes Eckel's own philosophy of object and program design. A must for every C++ developer's bookshelf, Thinking in C++ is the one C++ book you must have if you're doing serious development with C++.